Today marks the first day of Vegan MoFo. What is Vegan MoFo, you ask? Vegan MoFo stands for the Month of Food and the only real rule is to post as much as you can about vegan food for the month of November. For my part, I would like to post a different recipe, three times a week, from around the globe. What's a better way to start off MoFo, than by posting a recipe from the good ol' US of A! 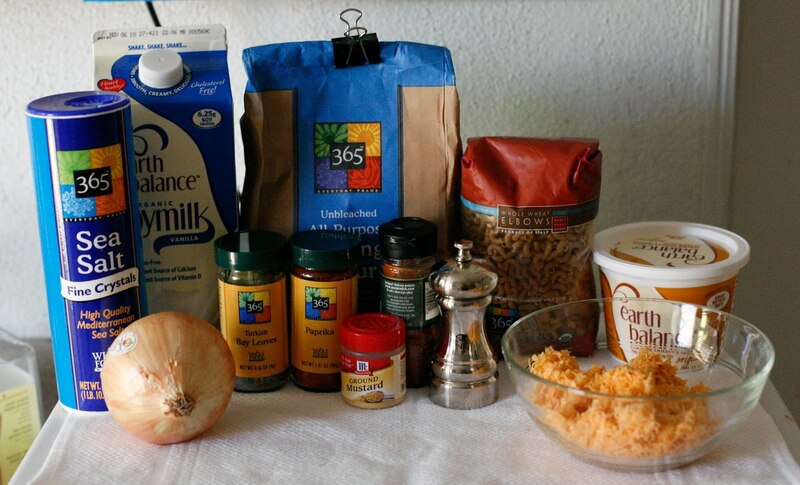 I've tried so many vegan recipes of mac n cheese..some containing cashews and some with curry. Nothing seemed to be of my liking. 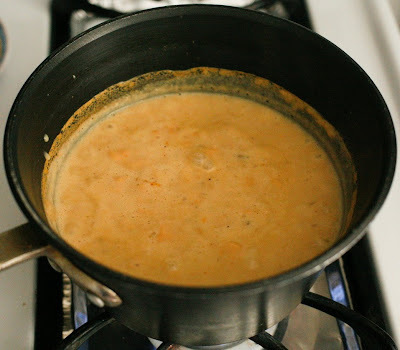 Then last week, something suddenly hit me..what if I make mac n cheese the way it is traditionally made but I use Daiya cheddar cheese in replace of the dairy. It worked! This has to be the best out of all the recipes I've tried. Now its not exactly like how I remember mac n cheese to taste but it is pretty darn close. (For people who haven't tried Daiya yet, I highly suggest you do. I purchase mine at Whole Foods but I am sure it can be found at other all natural health food stores as well). 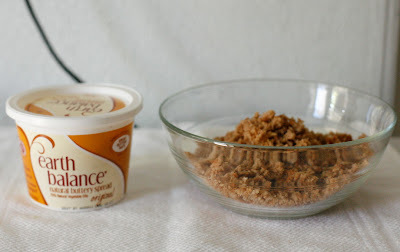 And now something totally unrelated for all my other food bloggers, Nancy of Spicie Foodie, will be hosting a monthly roundup of everyone's best recipe. So basically just submit what you think was your best recipe for, say, the month of November, and then you will see everyone's best recipes all up on the same page! Pretty neat! For my part, I picked the carrot cake I made earlier this month. Click here to check out my recipe and a bunch of other really yummy recipes for the month of October. 2. Cook pasta in a pot of lightly salted, boiling water for about 5 minutes. Just under it is slightly tender. 3. While the pasta noodles are cooking, start making the sauce. 4. 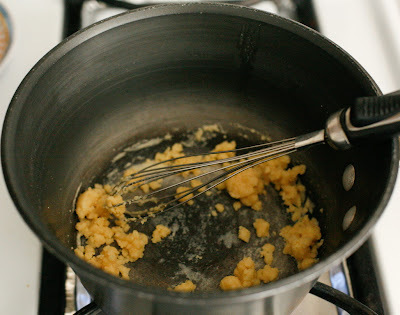 In a separate pot, melt the butter and then whisk in the flour and mustard. 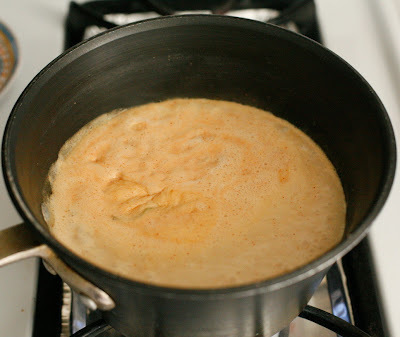 Keep on whisking on medium heat for about 5 minutes. 5. 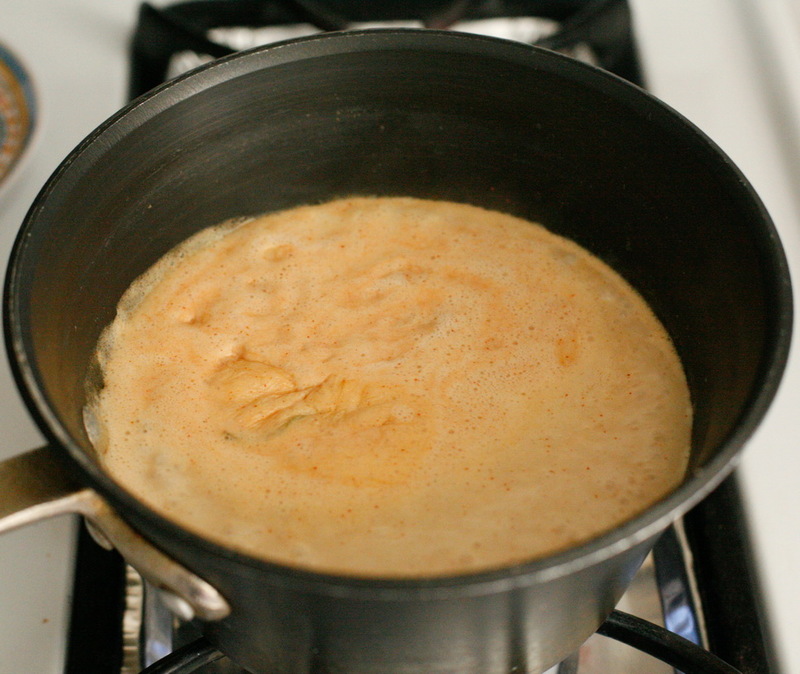 When all the lumps are gone, stir in the soy milk, paprika, cayenne, onion and bay leaf. Simmer for 10 minutes and then remove the bay leaf. 6. Stir in 3/4 cup of cheese. Season with salt and pepper. 7. By now your macaroni should be done. Drain well and then fold into the sauce pot. 8. 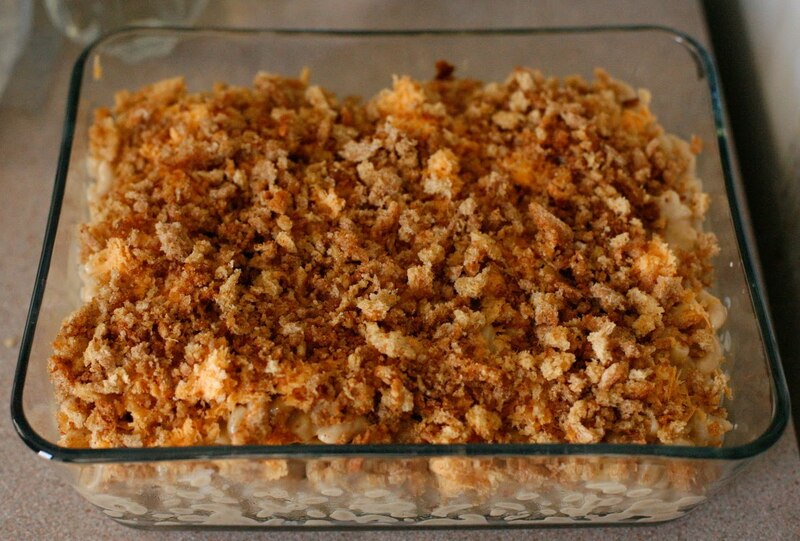 Pour into a 2 quart casserole dish and sprinkle the rest of the cheese on top. 9. 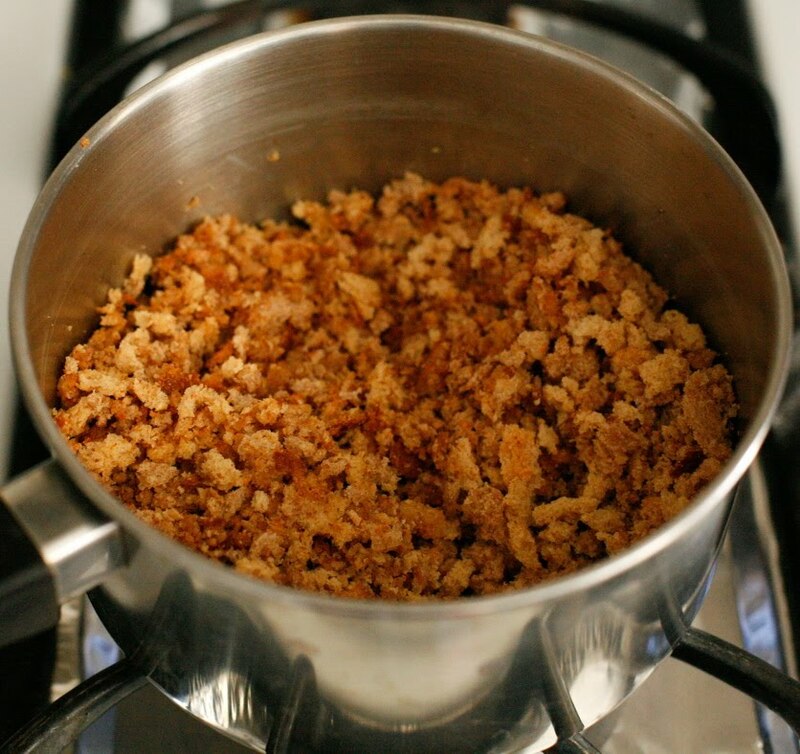 Melt the butter in a small pot and add the bread crumbs. Stir to coat. 10. 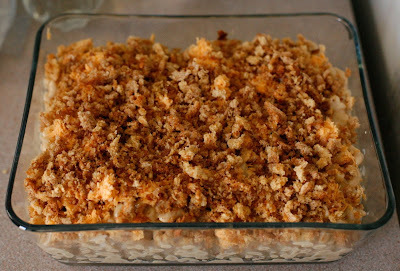 Top the macaroni with the bread crumbs and bake 30 minutes. 11. Remove from oven and let cool for 5 minutes before serving. Great MoFo kick off! I swear, you should get a cooking show; your step-by-step photos really add a lot and the end result always looks delicious. Like you, I've tried many a vegan mac n cheeze recipe...so far my favorite involves using winter squash to achieve the "orangey" factor. I"ve never tried it with Daiya...but I have a load of it stashed in my freezer...my next foray into mac n cheeze will be this one! This looks great! It's shaping up to be a comfort weekend on the horizon, so I may have to give this a spin. I'm eager to try Daiya after reading about it for months and months now. That mac & cheese looks fab! I love that name, MoFo kinda funny :) THanks for the tip on the Daiya, I would love to try it. 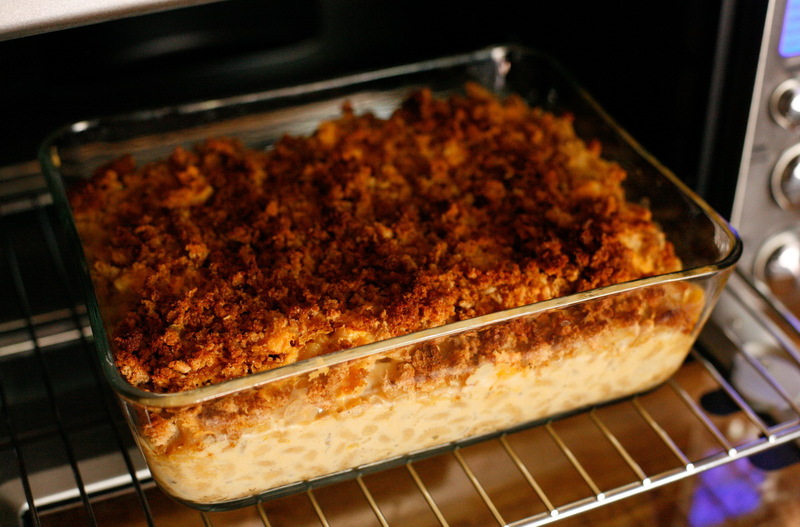 Your Mac& Cheese looks delicious. My husband also likes to add cayenne to his, and it taste great. I'll be checking in for your MoFo recipes, sounds like a great idea. Lovely photos! I like the step by step photo recipes. It's always nice to have a visual to go along with the actual recipe. 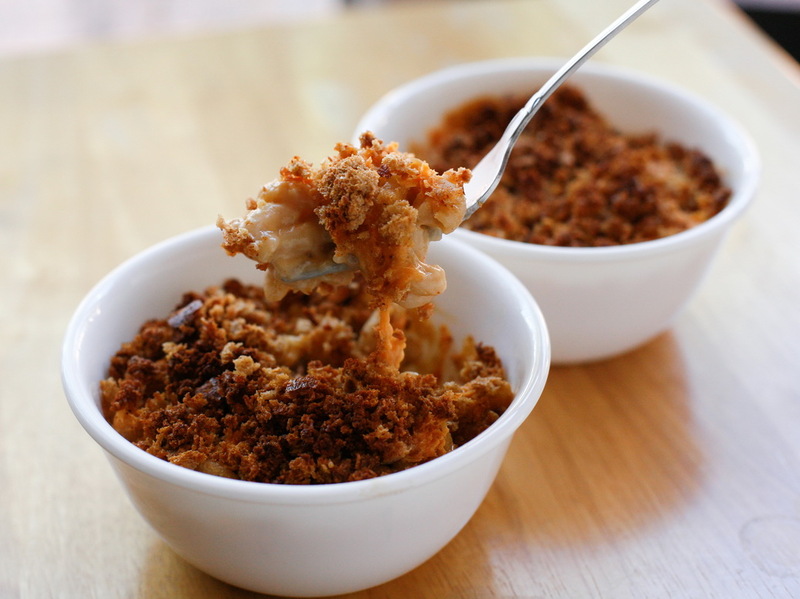 And vegan baked mac and cheese rocks! Yum, Jacklyn! This looks so good, and you have totally mimicked the look of cheese-good job, mamita;)! Candy - Aww you should! Amanda - You must try it! Best vegan cheese hands down! Midwesternvegan - Thank you! Yeah I also think its adds a lot more than just reading a recipe, which can be a little boring. Stella - Oh no! Comfort food can be unhealthy though..I hope I haven't been posting too many fattening recipes haha its this cold weather..it makes me want comfort food! I've been craving some homemade mac and cheese lately. Love the inclusion of bread crumbs. Awesome step by step. 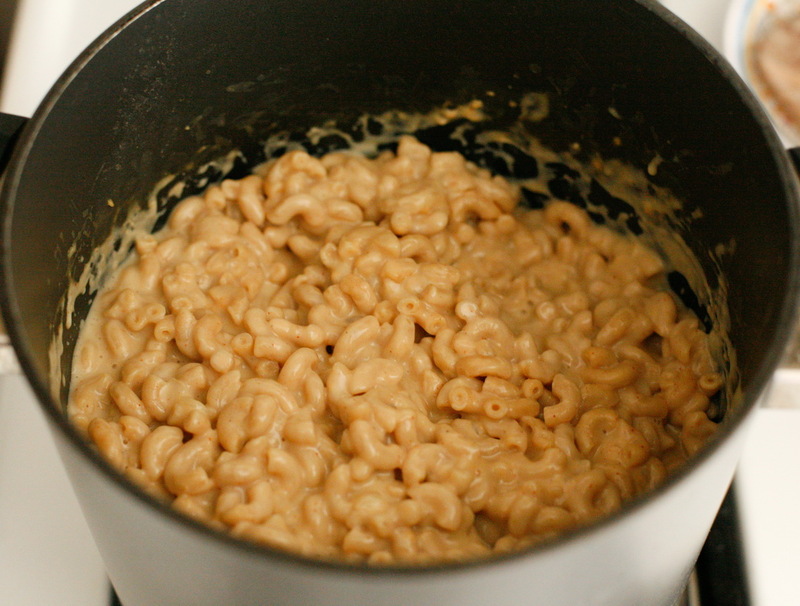 I need to make me some Mac and Cheeze PRONTO! I must have been so excited to make this when I first read about it that I forgot to mention! I was coming back tonight to get the link to put with my photo. This was a wonderful recipe. Thank you for sharing. i want to try this recipe SO BADLY ! I came to check out your recipe after Jessica posted - yum! Oh my, it turned out so good! And I loved the pictures depicting the whole process. I also would love to recommend the Goulash dish! Amazing! Wow, I'm a huge vegan macaroni and cheese fan. That looks marvelous!